Professional cleaning of carpets and upholstery in Holmes Chapel and surrounding areas. Expert cleaners of domestic Carpets, Upholstery, Sofa’s and rugs across the Holmes Chapel area. We also provide superb cleaning of carpets to commercial premises including offices, shops, hotels, schools and more. Free quotes and advice without obligation. Being situated just 15 minutes away in Winsford, we have gained many regular satisfied clients in your area since we became established in 2001. We also cover the local areas such as, Brereton, Cranage, Goostrey and Swetenham. 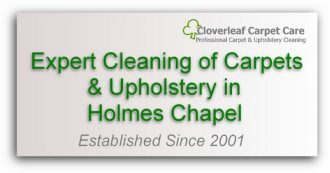 Here at Cloverleaf Cleaners we are skilled and trained in the latest techniques in the carpeting and upholstery cleaning industry to make sure you get perfect and professionally cleaned soft furnishings for your home or business. Carpets looking disappointing and dull through years of traffic? Why not have them revitalised with deep down cleaning to restore the colour and freshness, just how they should feel and look! Our state of the art equipment cleaning system ensures you get the best possible results in Knutsford. We use high performance hot water extraction and vacuum technology which removes soil from deep within the pile and it’s safe for pets and children. Call today for a FREE, no obligation quote. 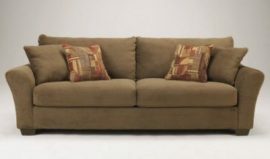 We also provide the professional cleaning of fabric upholstery and leather furniture in Holmes Chapel. If you are deciding about having your carpets cleaned, why not consider having your suite, sofa or fabric furniture freshly cleaned. We provide friendly free no obligation quotes for your consideration. If your moving into a new home, it’s always good to start with freshly cleaned carpets. We have provided cleaning of unfurnished properties for tenants, landlords, agents and home movers alike for many years. If you leave your rental property with unclean carpets, your landlord could send you a large bill or make a deduction from your deposit! 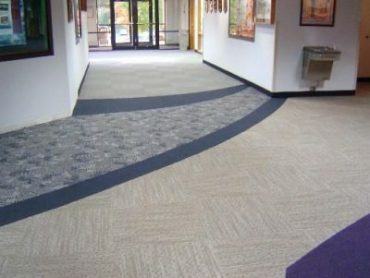 We clean and restore thousands of square feet of carpeting every year to office units, shops, restaurants, hotels, public houses and residential homes and more. Ensure you maintain or improve the image and air quality of your establishment, not only for your prospective clients but also your employees too.